What is My Listing Agent Really Suppose to Do? The role of the listing agent; the real estate broker that actually has the contract with the seller, not the buyer. This is the licensed agent or broker the has the authority to list, market and facilitate a transaction or sale between the buyer and the seller. Many people that think that they can sell the house themselves try to known for a while and eventually use a listing agent. A lot of people think they will save money by selling it themselves rather than paying a commission to the listing agent, but by the time they actually do sell, they probably drop the price lower than where would've sold in the beginning with an agent. They really haven't saved the money. 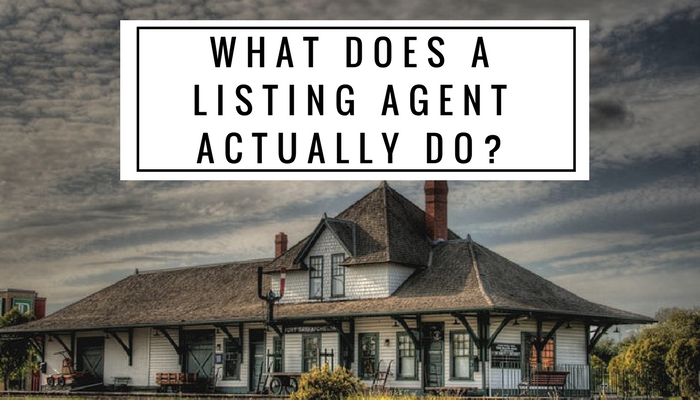 But what is a listing agent supposed to do? A listing agent is not necessarily the same agent that will bring the buyer. When you decide to sell your house the listing agent will write up a contract and in that contrac, it will state how much commission the agent(s) will receive from the actual sale of the property. A typical commission is about 6%. When there are two agents involved, both the buyer's agent and the listing agent, that is typically split down the middle. If the same agent that lists the property also brings the buyer, that listing agent could receive the full 6% commission or it can be negotiated, but once it's in the contract, it is set in stone. Sellers could write in a negotiation to the commission. Let's so that if there is a buyers agent and the listing agent, the total commission would be 6% but if the listing agent also brings the buyer can reduce that to about 5% or less. Everything is negotiable once it's in writing, it usually can't be changed without prior agreement. Listing agents primary job is to facilitate the transaction on the seller's behalf. It is not required for the listing agent to perform an open house although many agents will agree to do so for the seller. Open houses are fine, but statistics have proven that it is not the best way to sell a house. It is, however, the best way for the neighbors to snoop through your house. A little industry secret is that most open houses are for the listing agent to gain new buyers, not necessarily to sell the house, although it does still happen. The listing agent also must market the property on the local MLS (multiple listing service). Every county or region in the US has their own MLS and the majority of homebuyers and buyers agents will start their search on the MLS. Many real estate companies and large websites will have access to the local MLS, but only the actual MLS will have every listing by licensed agent for that area. This is why having a buyers agent look through their own MLS is really the best way to find exactly what you want. Not every listing will be posted on national websites. It is the listing agent's job to present the property appropriately. Agents will often use tricky terminology such as cozy to describe a very small house or "bring your ideas", which typically means the home is a fixer-upper. Buyers agents have also gotten very skilled at translating these terms for their buyers so it would be best for the listing agent to represent the home exactly as it is. It's important for the agent to identify as much about the property as possible including size, location, features, how many rooms, size, garage space and any outbuildings. This listing will go out throughout the MLS and national real estate websites an agent may even promote the property on their own website or social media although it is not required. This is important to ask you listing agent to make sure that as many buyers as possible have access to view the property. The Listing agent will take photos of the property. Not every agent will take amazing, fabulous, blow your mind photos so it's important to ask about it. Some will hire a great photographer and as we all know, photos can make or break a sale! It's so important to have awesome, clear and genuine photos of a listing. The listing agent will also negotiate the contract on the seller's behalf. It is the listing agent's responsibility to advise and give suggestions to the seller on how to handle offers, counteroffers, contingencies and any addendum's that come along. A listing agent is to explain and help the seller understand exactly how to price, market, and accept offers. The region has already done the research needed to price the home appropriately. A good listing agent will be honest with you about the price; about listing agent will tell you anything you want to hear. This usually ends in frustration later on when the home will sell due to a higher price. The listing agent's will go between for the buyer and the seller. The listing agent will communicate with the buyers agent, negotiate on the seller's behalf, and carried the deal on. A good agent will also keep the seller informed about any showings, advice, showing tips and information other buyers and their agents, and offer their own ideas when it comes to staging and properly preparing the home for sale. It is not the listing agent's job to actually clean your house. Although, it's been known to happen. Listing agents job is really to represent the seller throughout the process. The seller should never feel like they are alone, confused, or frustrated with the deal. A good agent will keep the seller informed, up-to-date, and feeling good about the sale of their home. The listing agent will also provide dates, times, and help schedule appointments if necessary for appraisers, inspectors and walk-throughs. We love listing and selling houses and we try to do just about everything we can for our sellers. We want your home sold quickly and for as much profit as the market can bear. If you are ready to sell your house and you'd like to list the Sokoler Medley Team give us a call today. READY TO LIST?